COLUMBIA, Mo. 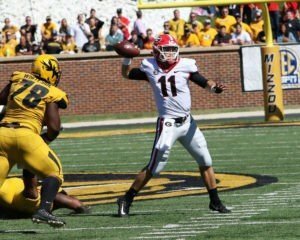 – A defensive first half and offensive onslaught in the second half pushed the second-ranked Georgia Bulldogs past the Missouri Tigers, 43-29, Saturday afternoon at Faurot Field at Memorial Stadium. A fumble recovery touchdown in addition to a blocked punt scoop-and-score highlighted Georgia’s scoring in the first half. 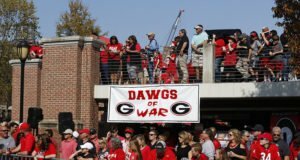 Meanwhile the fast-paced offensive second half consisted of seven total scores with Georgia (4-0, 2-0 SEC) using three touchdowns and a field goal to seal the win. With its first loss of the season Missouri falls to 3-1 and 0-1 in the Southeastern Conference. Sophomore quarterback Jake Fromm finished 13-for-23 with 260 yards and three touchdowns and one interception despite finishing the first half with only 66 yards in the air. Fromm’s main target was junior wide receiver Riley Ridley who hauled in five catches for 87 yards and one touchdown. On the ground, junior back Elijah Holyfield piled up 90 yards on 14 carries and sophomore D’Andre Swift added 71 yards on 16 attempts. 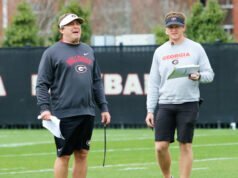 Defensively, junior J.R. Reed led the team in tackles with eight with fellow defensive backs Deandre Baker and Richard LeCounte tallying seven apiece. D’Andre Walker created havoc in the backfield with two sacks including two forced fumbles. Freshman defensive back Tyson Campbell returned a fumble for a touchdown, while redshirt freshman Eric Stokes blocked a punt and returned it for a touchdown. The Bulldogs headed into the half with a 20-7 lead after defense and special teams dominated the pace of the game. On third-and-nine, Campbell stripped Missouri’s Al Okwuegbunam and scoop-scored for a 64-yard fumble return to put the first points on the board. 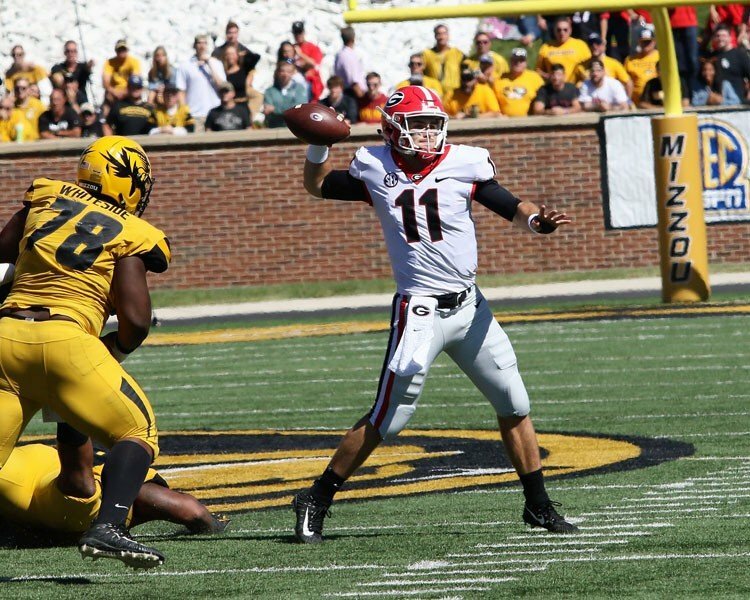 After the Tigers evened the score, junior place kicker Rodrigo Blankenship connected on a 44-yard field goal to move Georgia back in front 10-7. On the ensuing drive, the Georgia defense produced another turnover – this time a 43-yard interception return by linebacker Tae Crowder. The takeaway turned into another Blankenship try, a 21-yard field goal, for the 13-7 lead early in the second quarter. Special teams then made its splash later in the second to put the Bulldogs up 20-7. Georgia bombarded Mizzou punter Corey Fatony with Stokes blocking the kick and scooping the football for an 8-yard touchdown. A back-and-forth third quarter saw both teams trade touchdowns. First, Georgia with a 33-yard touchdown pass from Fromm to Ridley capped the five-play, 59-yard drive. Mizzou responded with a long drive and score, but the Bulldogs struck on their second play from scrimmage. Fromm threw a jump ball to sophomore receiver Jeremiah Holloman who eluded the sideline to run free for a 61-yard touchdown. The Tigers got the last touchdown in the third to put the score at 33-22, and the scoring commenced immediately in the fourth quarter. 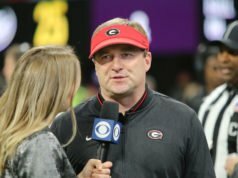 On the first play, Fromm connected with a wide-open Mecole Hardman for a 54-yard touchdown pass to finish the Bulldogs’ longest drive of the game that spanned 77 yards in just five plays. Missouri quarterback Drew Lock pulled the game to a 40-29 margin on an 11-yard run with 10:47 left in the game. However, Georgia took the reins in terms of time of possession to seal the game. 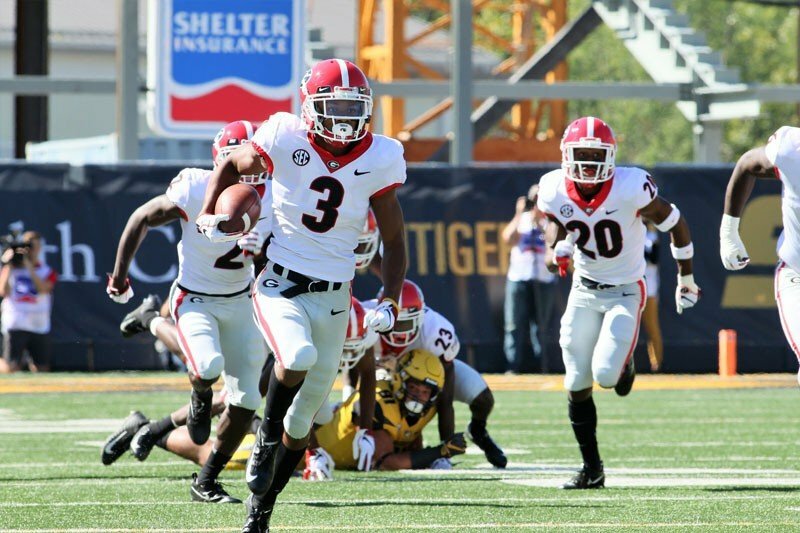 The Bulldogs ate nearly five minutes off the clock before Mizzou blocked a field goal, but the Georgia defense forced a turnover on downs to mitigate the loss. Another drive taking up 3:17 ended with a 40-yard Blankenship field goal, putting the game at 43-29 with less than two minutes remaining. 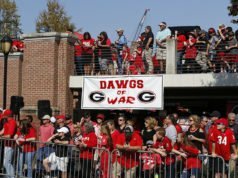 For the fourth straight game this year, Georgia (4-0, 2-0 SEC) scored at least 40 points marking the first time since 2012 the Bulldogs have done that. The Bulldogs return home for a two-game home stand starting with Tennessee next Saturday at 3:30 p.m., which will be aired on CBS.